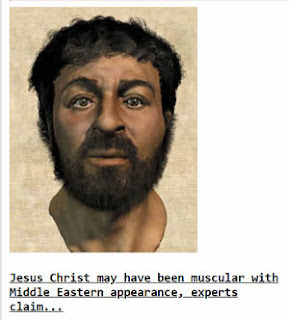 Marquette Warrior: Silly Drudge Headline: What Did Jesus Look Like? Silly Drudge Headline: What Did Jesus Look Like? Matt Drudge has some rather “interesting,” tabloidish headlines. Our all-time favorite was his link to a story, in the Houston Chronicle, about a woman who beat another woman with a frozen armadillo. But for utter silliness, the headline and picture above take the cake. Let’s see: he was from Galilee, north of Jerusalem, south of Lebanon. Smack in the middle of the Middle East. How would we expect him to look? The “muscular” part is less obvious. We really don’t know, but if he helped his dad in his carpentry work, in that era before power tools, that’s plausible enough. We do know his charisma was not due to any particular physical appearance. When you can do miracles, you can look any old way and still impress people. Usually, tabloids titillate with stories the truth of which is questionable. But in this case, they have published something blazingly obvious, and pretended it is some sort of revelation. He was a carpenter for almost 30 years, with no power tools. What do you think he would look like???? Will an Assault Weapons Ban Save Lives?